Well, that didn't take long. Just a little over 48 hours after Doug Melvin announced the Brewers were going into full sell mode, they were able to move one of the hottest names on the trade market. Zack Greinke leaves Milwaukee with a perfect 15-0 record and 2.93 ERA at Miller Park and in return the Brewers have acquired SS Jean Segura, RHP John Hellweg and RHP Ariel Pena. Let's get to know our newest Brewers a little better. Jean Segura is 22 years old our of San Juan, Dominican Republic. 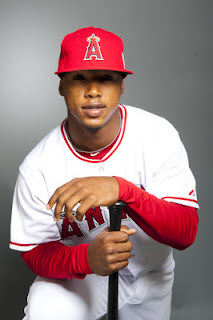 He made his Major League debut just a few days ago for the Angels on July 24th, 2012. Segura (left) appeared in the Futures Game this year in Kansas City during the All Star Game weekend. Segura plays mostly shortstop, but can also play second base. Jean bats right and throws right, and is speedy on the base path. Prior to the trade, Segura was ranked #2 on the Angels prospects list. At the age of 17, Segura batted .324 in 252 plate appearances with 2 HR, 31 RBI, 39 R, and 22 SB. Over six seasons in the minors, Segura is a career .310 hitter with 26 HR, 203 RBI, 257 R, and 135 SB. He does have a very high strikeout to walk ratio of 1.6 (206 SO vs. 122 BB), but with a little time in the minors for the Brewers he will learn that discipline. In his best season, statistically, he batted .313 with 10 HR, 79 RBI, 89 R, and 50 SB for Single A Cedar Rapids in 2010. Finally, this season for Double AA Arkansas, he batted .294, 7 HR, 40 RBI, 50 R, and 33 SB. All in all, very promising numbers with the bat. Lets take a look at the glove. In 362 games, Jean Segura has 56 errors in 1,686 chances which translates to a .967 fielding percentage. However, 18 of those errors have come this year in Double AA Arkansas. He carries a very impressive range factor per game (assists + putouts per game) is a 4.50. Now, many have said that Segura won't prove to be a good short stop, and will most likely convert into a second baseman. As of now, though, Doug Melvin has said that Segura will be a short stop for the Brewers organization. I am very thrilled to have this guy in our system and I look forward to his call up to the Brewers. Here is a video of Jean doing an agility drill in 2011. Through 5 seasons in the minors, he has a 16-19 record. That record seems shaky, but John didn't become a starter until last season. He was a relief pitcher for his first three season minus a start here and there. He holds a 3.66 ERA over that 5 year span. Other numbers for him, he has 305.1 inning pitched with 324 strike outs, which averages out to 9.6 strikeout per 9 innings. Very impressive. Also, he has a pretty decent strike out to walk ratio of 1.6. It's no Justin Verlander of 4.05, but it's not bad for a minor leaguer. His WHIP needs to come down a bit. It's at a 1.379 this year and 1.493 for his minor league career. Finally, over his 5 years of pitching, he has only given up 18 long balls, which transfers to a 0.6 home runs per 9 innings. That to me says a lot about his style of pitching, contrary to what I'm already hearing from people regarding his control etc. But hey, what are the minor leagues for? Correct, improvement. Give him a few years in our minors and he'll be just fine for a spot in our starting rotation. 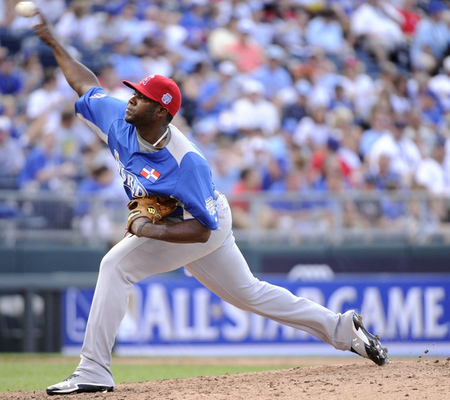 Ariel Pena was born in Los Jovillos, Dominican Republic and is 23 years old. 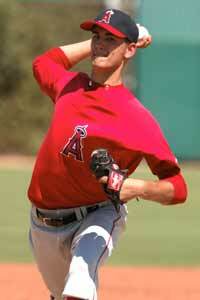 He was signed by the Los Angeles Angels as a non-drafted free agent on February 17, 2007. He is 6' 3". He bats right and throws right. Let's take a look at his numbers. Pena has been a starter since he came into the league. He holds a 45-27 record, which translates to a .625 winning percentage over 6 seasons. He has a 3.37 ERA over that time frame, with 601 strike outs and 273 walks, which is a 8.9 strike outs per 9 innings and a 2.20 strike out per walk ratio. Over those 6 seasons, he has given up 34 home runs in 609 inning pitched, which is a 0.5 home runs per 9 innings. Coaches trust his pitching, as he only has pitched one intentional walk over his time on the mound. He could see the Brewers main roster sooner then most guys we have in our system now. Overall I really like this trade a lot. Did we get the best players the Angels had to offer? Maybe. Did we get players that the Brewers had gaping holes in that needed to be fixed? Absolutely. It's a step in the right direction for what the Brewers have given up over the years to acquire guys like C.C. Sabathia, Zack Greinke, and Shaun Marcum. And, the Brewers are done yet. There are still less then 72 hours left before the trade deadline is over with and the Brewer have a lot of work to do. Don't be surprised if there is another big name move during the night or tomorrow morning, especially with Corey Hart and Aramis Ramirez putting up great numbers as of late. Until then, we sit and wait.